If you’re a photographer, you know that your photos get used without permission sometimes. Here’s my take on how to deal with those situations. I try not to approach this process from an emotional position, but that can be difficult sometimes. But if you start off angry, you risk drawing an angry reaction. Most infringers aren’t stealing your photos intentionally, and working with them civilly can make the whole process easier. You get your film back from the lab (bathroom for black and white, right?) and you scan your negatives. Digital photogs just unload their cards, of course. You select your edit from the set, you clone stamp some dust and dodge some faces. Then it’s time to share. If you post your photos on social media sites like Facebook or Twitter, they can be re-shared within the guidelines of the site’s Terms of Service. Typically this include retweets, shares, embeds, and so on — built-in functionality. On Flickr, Smugmug, 500PX and the like, you have more control over your rights, but still not a lot (particularly since Flickr introduced embedding in 2013). Take a moment to research the Terms of Service on each site you use to share photos, or read this PBS MediaShift article. When you post your images on your own site, as I do, you have total control. Legally, at least. Sadly, that doesn’t stop thieves from using your images without your permission. So pretty soon you start seeing your own photos pop up on other people’s sites. In the worst cases, they take credit for your images. In the best, they credit you and provide a link back to your site. In most cases, there’s simply no credit. You might stumble across your infringed photos by accident, or you might go looking for them. When it comes to photos I find used without permission frequently, every so often I’ll go looking for more instances of misuse. It seems like one infringement increases the likelihood of subsequent infringements. There are several ways to seek out your images, but they all amount to doing a reverse image search. I usually use Google Image search to do this, by way of Google Chrome. If you’re using the Chrome browser, you can right click on any image on your site and choose “Search Google for this image” to initiate an instant reverse image search. Fstoppers has more suggestions on how to get into the nitty gritty with Google Images or a tool called TinEye. As of June, 2014, you can also perform a reverse image search with Russian search giant Yandex. Copyright is designed to protect creators. If their work can be reused by anyone freely, the artists have no way to turn their creations into a living wage and thus no motivation to continue creating. Without creatives creating, there’d be … well, nothing, really. Commercial entities should know copyright laws fairly well and know better than to republish images they find through a Google Image search. Small businesses and individuals are much less likely to. Therefore, you need to have an idea of your rights when it comes to your images. Unless you’ve explicitly given up ownership of your images through a work for hire agreement, or as part of a specific contract, or unless the images were made while you were working as a staff photographer somewhere, you should always own your images. Some clients might not get this, especially if they are the subject of the images (think wedding and headshot clients). Outside of the situations above, if you pressed the shutter release (or tapped the screen), you own the image, wholly and singly, period. In some cases this may mean that if you hand your phone to someone else to take a photo of you, that person owns the image. You might still have an implied license depending on the situation, though. The Digital Millenium Copyright Act (DMCA) provides a variety of protections for photographers, including damages. To get a lot of the potential damages, you will need to be sure to register your photos with the U.S. Copyright Office within 90 days of their first publication. The DMCA provides an avenue for copyright owners to require web site hosts and owners to remove infringing works, known as a takedown notice. If the notice is filed properly, the DMCA requires that the host remove the offending content in a timely manner. * If the site is simply displaying the image directly from your site, they’re also stealing your bandwidth. You can prevent other servers from hotlinking your content if you’re a bit tech-savvy. Of course, you don’t have to demand they remove your image. This is your photo. You made it, fretted over the editing, nurtured your vision from something you saw or imagined from a bunch of photons into a finished product. You may have sweated or even bled to create it. And now someone has stolen it. It will probably happen again anyway. It’s not hurting anything. If you weren’t going to sell it yourself, you might not even feel that it had that much value in the first place. And that’s okay. If you don’t want to deal with the hassle of tracking down infringers and demanding to be made whole, you can let it go. You may want to pick your copyright infringement battles anyway. Even if you’re not really upset that someone else is using your photo, you might want to at least get the credit for it. 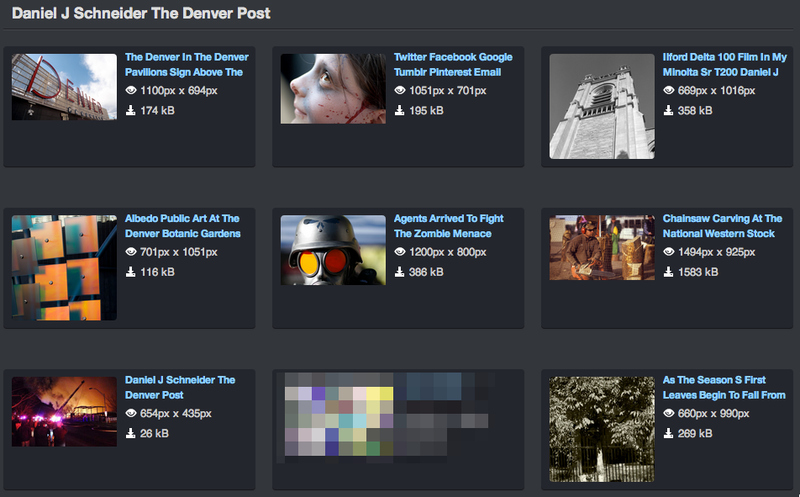 A link back to your site to get more eyes on your photos feels good, too. This is also a perfectly acceptable option. It might be better because at least you have a moment to educate a site owner on intellectual property rights. I think that most infringement happens through ignorance these days rather than willful theft. Sites like Photostealers dig into instances of image theft, particularly when another photographer takes credit for work that is not their own, and (negatively) publicizes the photographer and their site. This is something I might consider using against another photographer, although so far only a couple photographers have ever used my work and each instance has been a use they did not specifically claim as their own work. They still failed to credit to me, but the uses were demonstrative images on blog posts, not portfolio pieces. In general, though, I would say this should be reserved for people who haven’t responded to attempts to negotiate an equitable agreement. This is usually the most difficult option to get results with, but sometimes it’s worth the effort. Find out the email address for the owner of the site that’s using your work and send them a polite note explaining that you’ve found your photo on their site and have no record of licensing it for their use. Offer to sell them a non-exclusive unlimited license with mandatory credit for a reasonable rate (more on rates below). As far as I’m concerned, this is the DMCA takedown notice. If they fail to respond to that, you can hire an attorney and sue them — but unless you registered your photograph with the Copyright Office your recovered damages probably won’t even cover the cost of the attorney. Woe be unto you if you lose, though — you’ll be on the hook for your attorney and theirs, at the very least. I’ve had very good luck with a combination of options 4 and 5, personally. Tumblr — my photos usually appear there from Flickr’s Tumblr sharing button, which links back to my Flickr account. Pinterest — Every instance of my photos appearing on Pinterest has been accompanied by automatic credit and a link. Photo harvesting sites that are hosted offshore — Asian and Russian photo harvesting sites won’t respond and are beyond the reach of U.S. law, typically. For the rest, I’ll typically initiate contact based on the type of site. Sites like Lomography.com, FHM.com, other magazine sites and major blogs — high traffic websites, whether commercial or editorial*. I usually contact billing first and ask them how they’d like me to invoice them for my photo. This is often confusing to the billing department, but once I explain the situation politely, half the time they agree to pay me a licensing fee and attach a credit and a link to my site (I always demand credit, and a link to my site on any web use). If they don’t agree, or suggest immediately that they will remove the image, I’ll proceed right to sending them a DMCA Takedown Notice with links to the offending content. * Commercial sites are just trying to make money; editorial sites are providing (hopefully original) content such as articles, etc. These are your mommy bloggers, small businesses’ informational blogs, neighborhood information sites, web-hosted wedding announcements — things that are most likely being created and maintained by a well-meaning individual, not a corporate juggernaut. With these folks, I’ll usually try to contact the site owner directly. I explain that they’ve used my image without permission, and that legally that constitutes theft. I’ll tell them I’m happy that they like my photo and that I’d be happy to have them use it (depending on the site, that is) in exchange for a licensing fee. I’ll also explain the legal ramifications and the DMCA takedown process in general terms. Most of the time these folks can’t afford to pay you for a photo. I’m willing to work out a really low rate for them if I like their use of the photo, but often these sites are on a shoestring budget (you’re a photographer, so you know what that’s like). If ever one of these sites were a real nonprofit or charitable organization, I might consider letting them use my image for free as long as they included credit and link. I haven’t been infringed by any real nonprofits yet, though. These are often web designers or other spammy small businesses, with ugly sites that clearly steal tons of images from all over (do a reverse image search on the photos that aren’t yours — you might find other shafted photographers, and hopefully alert them). I also include sites with no contact method in this category — if they don’t make it easy to contact them, it’s usually because they’re trying to avoid being contacted, and legit sites would encourage that. When it comes to these guys, I go straight to the DMCA takedown notice. I don’t want to mess around and waste my time for someone who’s never going to pay for an image in their life. As soon as they take yours down, they’ll just steal someone else’s photo to replace it. If they even bother. In these cases, I find out who is hosting the image (a hosting company like HostGator or Bluehost, or a cloud service like Amazon S3 or Auttomatic’s WordPress servers) and send the takedown notice directly to the hosting company. As the owners of the servers with the stolen items on them, the hosting company is ultimately responsible if the notice isn’t honored, so it’s fastest and easiest to go straight to them. It’s also doing you and them both a favor by cutting out the middle man. I always try to be professional and civil in my communication, and have even wound up with LinkedIn connections as a result of working with site owners who’ve wound up with my images on their sites. It’s easy to be angry, but remember — most of these people don’t know the law. Many of the smaller ones may have even paid a service for their web design and been saddled with the infringing image by a thieving web designer. They will appreciate it and be more willing to work with you if you give them the benefit of the doubt, at least initially. If they don’t respond, or if they try to jerk you around, head straight to the hosting company. When I send a DMCA takedown notice I follow the format suggested by IPWatchdog in this post. I’ve made a few minor alterations, but this is very much what my notices look like. I list all the pages and file locations involved in each infringement in each notice, and only one instance of infringement in each notice. That means the home page, blog post, blog archive listing, and image location on the server get listed in the infringing items chunk. You have to have the link to your original post of the item, as well, to show you own it (this is the original article/photo URL). And yes — a separate notice for each instance of infringement. That means if they’ve stolen three of your images, you’re going to be providing all that in three separate notices — one for each photo. This process would’ve been cumbersome to impossible in the case of the galleryoftoday.com mega-theft insanity I wrote about last night. In that case, I emailed the hosting provider’s legal department directly and explained the circumstance that the company had stolen hundreds of my images and requested their help and advice so I could be made whole with a minimum of fuss. They didn’t want to handle 200 individual DMCA takedown notices any more than I wanted to file them, I suspect. Be sure that your DMCA takedown notices are complete or they may be ignored with little risk by site owners or hosting providers. You’ll use three tools to track down the responsible parties when you find a site using your photos: WHOIS, DIG, and NSLOOKUP. Gives you all the publicly available information about the owner of the domain name. Sometimes this is obfuscated by anonymizer services, in which case I’ll go straight to the host. Finds out the numeric IP address of the actual server that is providing the content. You may need to DIG several domain names if the image is hosted somewhere other than the rest of the site, or in cases of multiple images. Identifies the owner of the IP address you get from DIG. This is where you find out what company actually owns the servers the content is on. Use this to find contact information for the hosting provider — look for “copyright,” “DMCA,” or “legal” in their links or help sections, or Google it. You can see screenshots of the output of these commands in yesterday’s galleryoftoday.com post, where I show the types of results you can expect. Even if I don’t take any action on a given use, I always make a note of it so I remember in the future that I have seen it before and decided to leave it alone. I use these notes to check up when someone claims they have added credit, or removed an image. Often they remove the image from their blog post or page, but do not actually delete it from their servers. That’s why you have to get that link straight to the image file itself and check up on it, too. Always check that everything is right before marking each entry off on your stolen photos list, and don’t delete them — they could come in handy in the future if a site puts your image back up later, after they think you’re not looking anymore, or in future instances of theft. * I always create an invoice that includes who the image was licensed to, what the licensing terms are, the amount paid and the date paid. If your photos are being used in a commercial way — to endorse, support, or sell something — and feature recognizable people or places, you may need a model or location release. Stock agencies often won’t accept photos without a model release, and while one is not technically required to take or sell a photo, the need for one in some uses may offer you additional leverage if you can get the model to complain with you, or remind the infringer that their use of your work has opened them up to a lawsuit. This is what I do and may or may not work for you, or fit the industry as a whole. I do not make my living selling photographs and I don’t produce work on assignment or sell through a stock agency, so my circumstances are different than a lot of yours. There are websites and software packages that claim to help you determine the value of your work, but I have not used nor can I recommend any of them in particular. I think the best thing to do is read up on how other photographers price their work in similar situations. I generally start by searching stock agencies, in particular Getty Images, for photos with similar content. 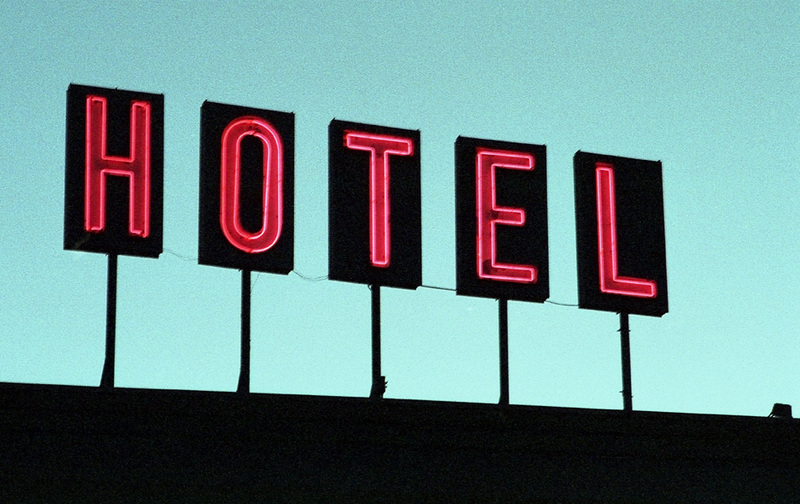 Here I searched for “hotel sign” and chose a photo vaguely similar to mine above. Getty has a really handy price calculator. You fill in options such as how long the use is for, what kind of size and placement, etc., and it gives you a price for the licensing. Sometimes these are much higher than I think my work could ever command, but I’ve been surprised by some people’s willingness to pay for a photo after the fact. Maybe they feel bad for screwing up. Rough guidelines: I’ve never taken less than $50 for a licensing agreement. I’ve never charged four figures. 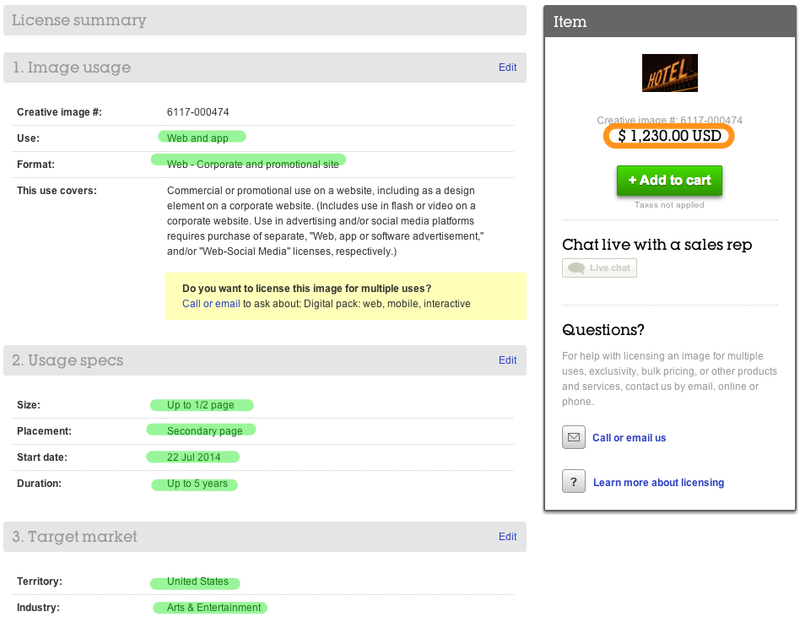 Usually I’m asking for $100-250 for web use, with a non-exclusive, unlimited license with mandatory credit and link. Non-exclusive means that I can license the same image to others, as well. Unlimited means for all time — with the web, especially, it makes sense not to limit the time period. I always demand credit and a link (on the web, at least). It’s your photo — do with it as you please. I’ve written this only as an explanation for my process. And for all that it sounds complex, after a few rounds of emails most of it will be second nature. I can go from searching to filing takedown notices in a matter of minutes these days. I would highly encourage you to do your own further research to understand your rights and options better. Follow the links in this post, and the links in those posts, and Google it yourself.